In the bowl of a food processor add the Traditional Basil Pesto and avocado; mix to combine; set aside. In a large pot bring 4 to 6 quarts of water to a rolling boil; add salt to taste and the Farfalle; stir gently. 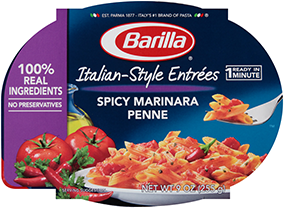 Cook pasta according to package directions; remove from heat and drain well, reserving ½ cup pasta cooking water. Return pasta to pot; stir in the baby greens and Traditional Basil Pesto mixture; add pasta water as needed to reach desired consistency. Serve topped with fresh basil leaves and Parmesan, if desired. Customize it: Let the dish cool slightly and serve it as a pasta salad for your next picnic or potluck.